My website has been online since 1999 and it is getting a much needed refurbishment. You will still find all the familiar sections, like Gingerbread houses, Greeting cards, Post cards from UK and the much visited GardeningSection. The website has grown from a very simple construction, (which you can still find on the website project section) to a huge website with over 20 different sections consisting of a portfolio of web and graphic design work, a CV and contact details, photos, hobbies and interests, and an extensive collection of private family photos. New of 2011 is my Blog, where many of the photos I take also have ended up, and new of 2013 is my Online Art Gallery. You can find link to both on the the top navigation panel. This website is updated regularly so be sure to come back again sometime soon! Come visit my Online Art Gallery! You can see more than one hundred pictures already and new additions are uploaded weekly. You can buy greeting cards, framed art prints and canvas reproductions of my original photos and digital art - or you can just do some window shopping. Prints are sent worldwide and payments accepted in a variety of currencies by card and Pay Pal. 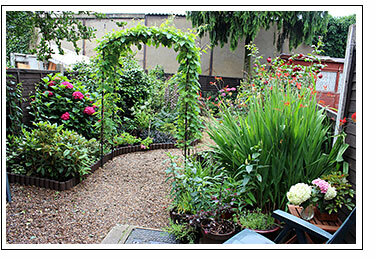 You can visit my garden here on my website or on my blog. I write several times a week on my blog, mainly about what's happening in my garden and I usually add several pictures from my garden on every post. Look out for the post every 15th of the month where I write about what's flowering in my garden right now. About four times a year I make a picture slideshow with the best photos from my garden and these you can find here on my website in the gardening section. You can find links to both blog and gardening section on the left hand navigation panel. Copyright © 2013 Graphicality. All Rights Reserved.